As students settle into the routine of classes, studying and making new friends, it’s a great time to send them a message that you’re thinking of them. It can come in many different forms, whether it be a phone call, FaceTime, text, hand-written letter, or even a gift basket such as our M Gift package. Study Break -- which includes a big selection of goodies to take the stress out of studying. The basket is filled with soda, crunchy snacks, assorted cookies and sweets, Pop Tarts and a Michigan travel mug. To Your Health -- keep your student healthy during this busy time with a collection that includes fresh fruit, trail mix, oatmeal, Fig Newtons, an energy bar, bottled water, a variety of sweet and salty snacks and a reusable water bottle. 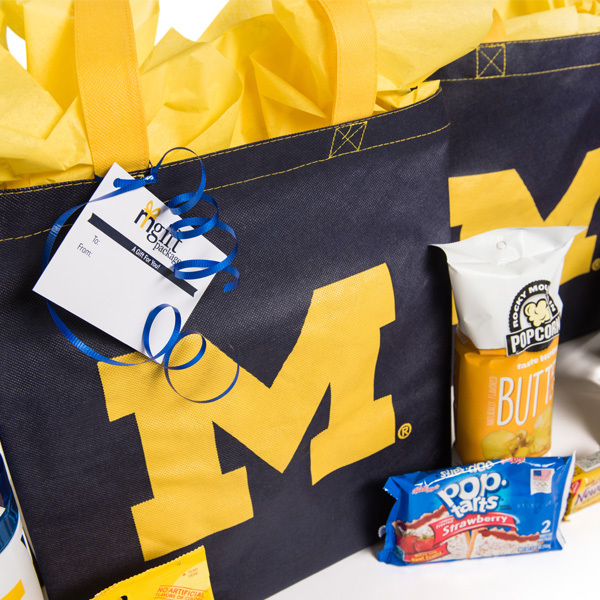 M Gift Packages are also available with themes such as Get Well Soon, Movie Night, and Good for U, which is filled with healthy snacks and U-M items. Upcoming packages include themed Valentine’s Day baskets. Simply place your order by 4 p.m. (EST) two days in advance of when you would like the gift package delivered. Then your student can pick-up the package Monday through Friday at nine convenient Michigan Dining Retail locations (free of charge) and 13 Residential Community Centers for a $10 delivery charge. Just place your order online and select the pick-up or delivery location. Proceeds from M Gift Packages support U-M student programs and campus facilities.